In an age when corporate mentality seeps its way into all corners of society, even (we gasp!) the artworld, there are a brazen few holdouts bent on creating an almost utopian-style, communal approach. One of those bold adventurers protecting the outer margins of alternative theater is Julianne Brienza, the fearless (and yes, this is no exaggeration) leader of the Capital Fringe Festival in Washington, DC. Last night I had the pleasure of meeting Julianne at the Fringe’s Baldacchino Gypsy Tent on New York Avenue, where artists co-mingled with ticket buyers over beer and prosecco on tap on an unusually cool, breezy night in typically muggy DC. To bring the Fringe into some critical perspective: my entrance at the Tent occurred just a few hours after I had interviewed an equally fearless Craig Saper (aka dj readie), one of my esteemed guests on The Post Reality Show: TALK MEDIA! (disclaimer: it’s part of the Fringe). Now Craig is a lofty academic, cutup writer, historian of the avant-garde, and the author of the seminal Networked Art. It was in the latter that he coined the term “intimate bureaucracy,” which is not, I declare, an oxymoron, but rather a profound commentary on alternative culture. You can probably divide the world between those who climb to the top, and those who bravely mine the riches of the so-called bottom, eager to prove that changing the world isn’t always the prerogative of the rich and powerful. The idea of the intimate bureaucracy was the mantra behind the US Department of Art & Technology, my appropriation of the US Government, which proved that through the lens of the imagination, you could visualize a better world. You might ask, how is a theater festival an intimate bureaucracy? Easy when it comes to the Fringe. This is an organization that sidesteps the established theater world, where the contemporary war horses prevail, giving voice to artists who push boundaries we didn’t even know existed. And how has the Fringe redefined bureaucracy? Because they are a quasi-non-hierarchical artist-driven organization, save the fearless Julianne who with her staff holds this potentially anarchic system together by the skin of her teeth. The Fringe is more like a family: the artists hang out with one another (at the Tent), exchange new ideas over bubbling prosecco, and generally interact with camaraderie not often seen at the highbrow festivals. 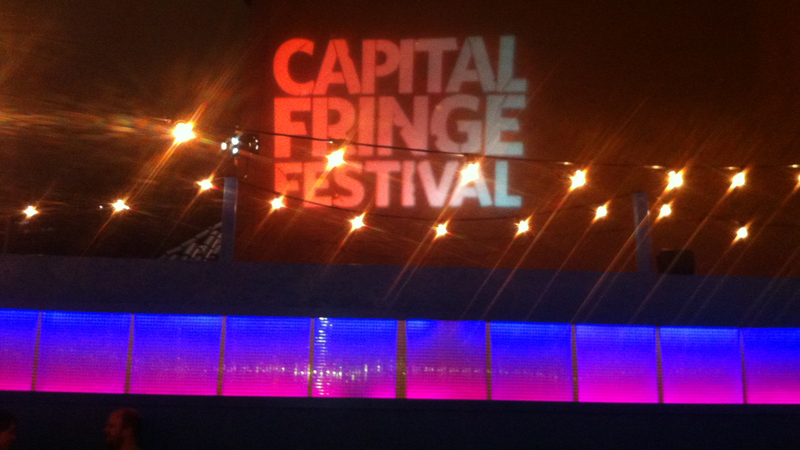 I declare, in my sometimes cynical view of the arts in Washington, DC, that the Capital Fringe is revolutionary, a force to be reckoned, and yes, an intimate bureaucracy. As it should be! This is the nation’s capital and an essential proving ground for creating new social models. The avant-garde is not just an artistic movement, it is a way of life, and particularly transformative over prosecco on tap! Such is the risk of exploring the outer fringe of even the Fringe here in the Nation’s Capital, where Washington is another word for the status quo, not just in politics.